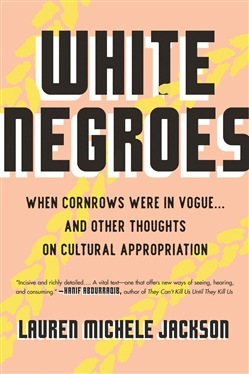 Explores how trends started in black communities are co-opted then turned into white profit and how this appropriation continues to uphold economic, political, and social inequality. In White Negroes, cultural commentator, essayist, and scholar Lauren Michele Jackson explores trends started in Black communities that have caught on and become cool, hugely popular and lucrative, but that exclude Black communities once mainstream audiences and mainstream dollars latch on. The consequences of this phenomenon can be easy to miss, as it is so ingrained in our consumer habits. Yet over and over, Black intellectual property is converted into white profit - one hashtag, hair style, music genre, and dance move at a time. This, Jackson argues, plays a role in keeping Black people from achieving economic, political, and social equity. Weaving together media scholarship and cultural critique, Jackson re-situates cultural appropriation as more than just a new buzzword. It is, she contends, simply another chapter in the long history of whiteness thriving at the expense, stolen labor and ingenuity of Black people. Further, her interrogation and exposure of the interracial antagonism resting on the other side of appropriation unravels behavior that feels normal only because it is common. Piercing, audacious, and bursting with pop-culture touchstones, White Negroes introduces a bold new voice in Jackson. Her debut is both a love letter to the creativity of Black folks and an urgent call for more thoughtful consumption by those who consider themselves "allies." Acquista White Negroes in Epub: dopo aver letto l’ebook White Negroes di Lauren Michele Jackson ti invitiamo a lasciarci una Recensione qui sotto: sarà utile agli utenti che non abbiano ancora letto questo libro e che vogliano avere delle opinioni altrui. L’opinione su di un libro è molto soggettiva e per questo leggere eventuali recensioni negative non ci dovrà frenare dall’acquisto, anzi dovrà spingerci ad acquistare il libro in fretta per poter dire la nostra ed eventualmente smentire quanto commentato da altri, contribuendo ad arricchire più possibile i commenti e dare sempre più spunti di confronto al pubblico online.